Easter brings back a lot of happy, dreamily pastel memories filled with peeps, eggs and Whoppers' Robin Eggs. 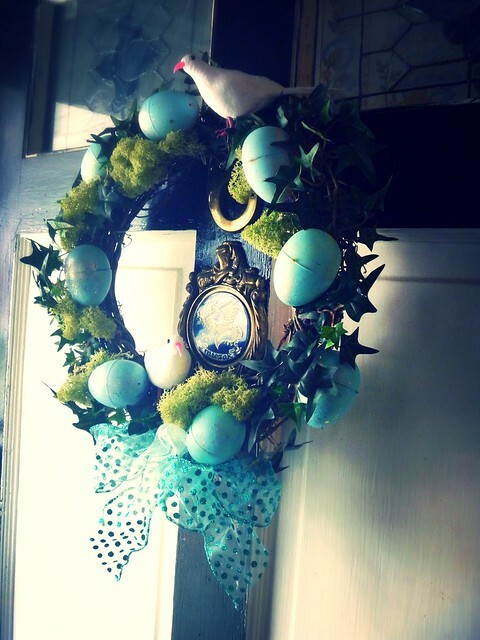 Those adorable malted eggs actually served as inspiration for the wreath we see here. 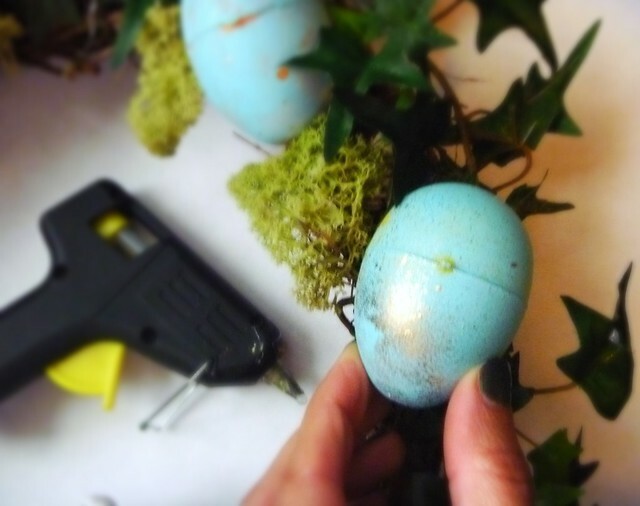 Something about the powder blue eggs, speckled in gold, peeking out from moss and ivy was a nice change from the powdery pastel egg covered wreaths we've come to expect this time of year. In fact, this might stay around all spring. We'll see. The most time consuming part of this project was painting the eggs. I used acrylic paint in an aqua blue color, dabbed on with a sponge brush. This gives the eggs a nice bit of mat texture. Once dry I spritzed and splattered on droplets of metallic gold spray paint for a speckled effect. If too much paint sprayed out on the eggs, I went back over it with some more of the blue paint. Then I started wrapping the silk ivy vines around the twig wreath form, attaching them here and there with florist wire (twist ties salved from garbage bags works great too). On top of this I hot glued on the Easter eggs and let them dry. 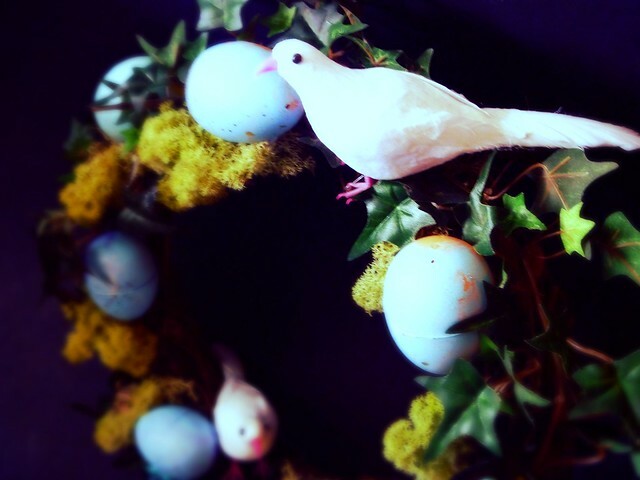 Lastly I stuck clumps of moss around the eggs, made a simple bow out of wired ribbon and white tulle and stuck two little doves on top. That's it! 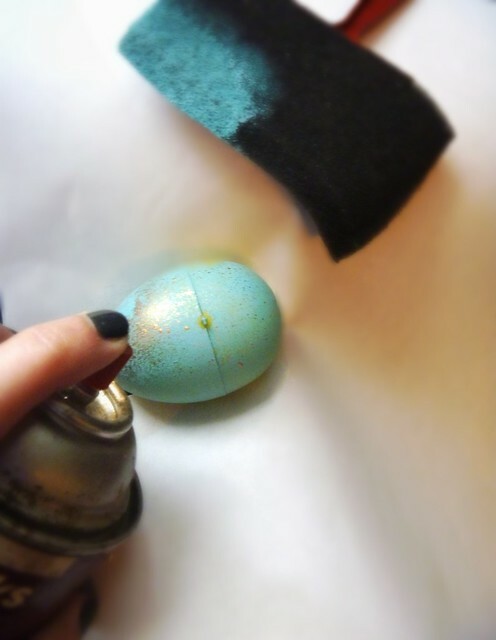 Burlap, puffs of tulle and squiggly Easter grass would definitely make great alternatives to the materials used here. 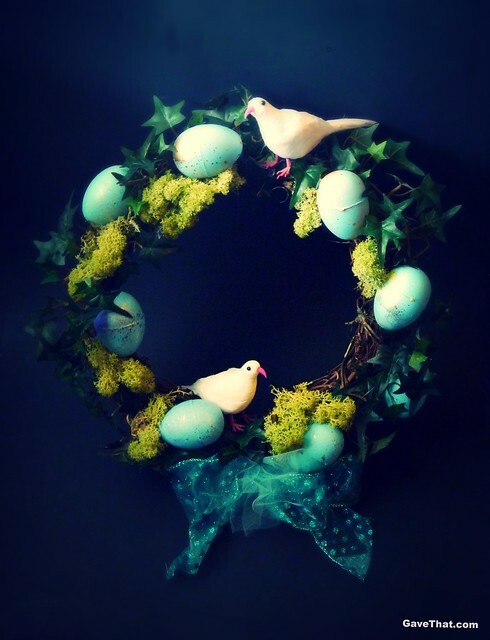 For another wreath idea, see how to make this living wreath with hens & chicks over here.